Love your box! That stick pin is so pretty! Now I'm curious...was inside the box? Love the pretty gift box and the stick pin. I came looking for your hop project and found this amazing box you created a few weeks ago! So happy it worked out that I had time to come say hello. This is great, Rebecca...that pin is gorgeous with your gift box. I'll be back for your hop project in a bit! Happy Friday dear lady! Hi Miss Rebecca. Happy I too could stop in for the hop and come across this beautiful box. I like the colors and swirls. 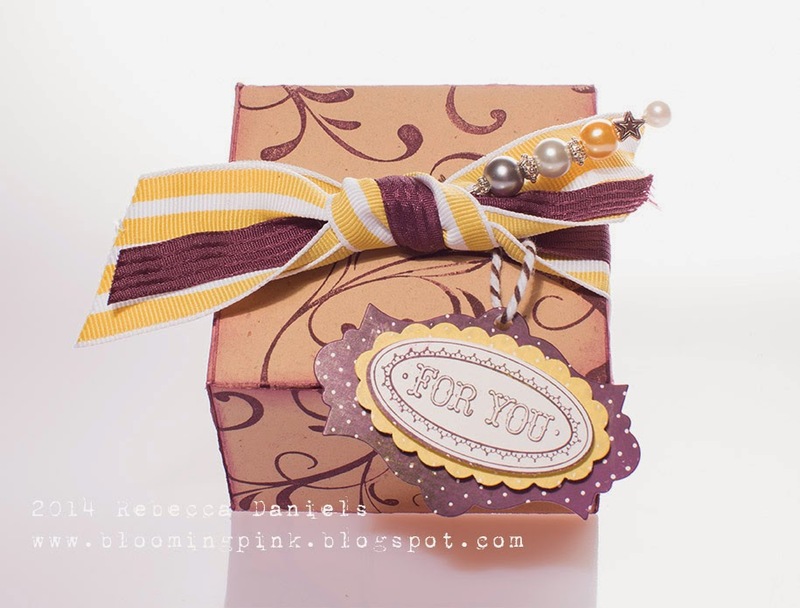 And PP Stick Pin gives your box added fun but elegant look. I came a-hopping, but found this beauty. Love the box! Hey, Bek. You need to visit me here in WI. We made it ALL the way up to 51 degrees today and there are frost warnings for tonight. On the plus side, the Northern Lights are supposed to be spectacular tonight after midnight. Can't wait! I came to see your project for the September hop, but I guess it isn't up yet. But I really love this box! That pin is gorgeous and the perfect addition!